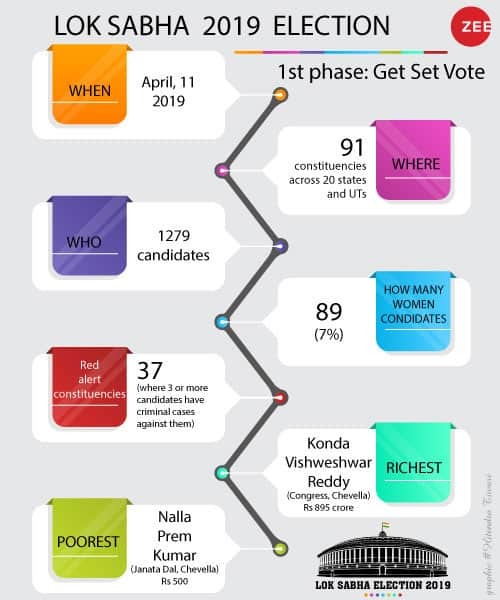 As many as 20 states and union territories participated in the first phase of Lok Sabha 2019 election on Thursday. While the day saw sporadic incidents of violence and some allegations of EVMs malfunctioning, polling was mostly peaceful and organised. States and UTs which went to polls on Thursday, April 11 are Andhra Pradesh, Arunachal Pradesh, Assam, Bihar, Chandigarh, Jammu and Kashmir, Maharashtra, Manipur, Meghalaya, Mizoram, Nagaland, Odisha, Sikkim, Telangana, Tripura, Uttar Pradesh, Uttarakhand, West Bengal, and UTs Andaman and Nicobar Islands, Lakshadweep. The results of the general elections will be declared on May 23. The highest voting was seen in Tripura (81.8 per cent) followed by West Bengal (81 per cent). 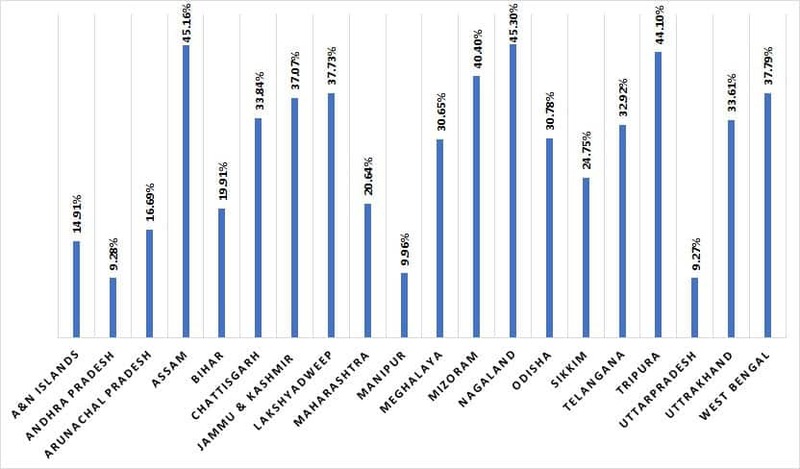 Arunachal Pradesh (2 seats) - 66%, Bihar (4 seats) - 50%, Lakshadweep (1 seat) - 66%, Maharashtra (7 seats) - 56%, Meghalaya (2 seats) - 67.16%, Odisha (4 seats) - 68%, Uttar Pradesh (8 seats) - 63.69%. 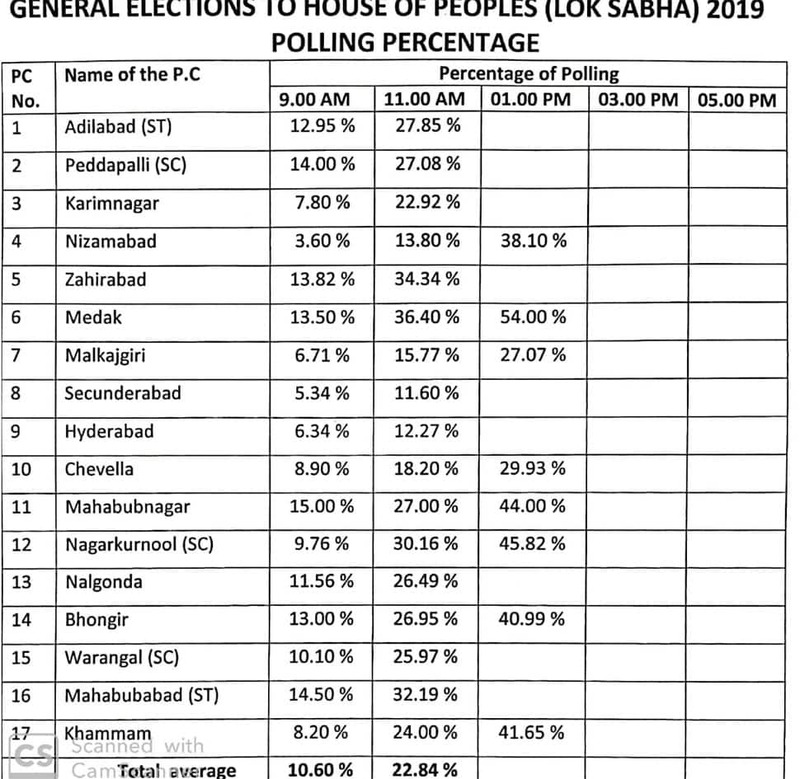 UP overall: Saharanpur - 70.68 per cent, Kairana, 62.1 per cent, Muzaffarnagar - 66.66 per cent, Bijnor - 65.40 per cent, Meerut - 63 per cent, Bagpat - 63.9 per cent, Ghaziabad - 57.6 per cent and Gautam Buddh Nagar - 60.15 per cent. Sinha informs voting on Thursday took place across 1.7 lakh polling stations in the country, adds that polling has now concluded completely in 10 states. 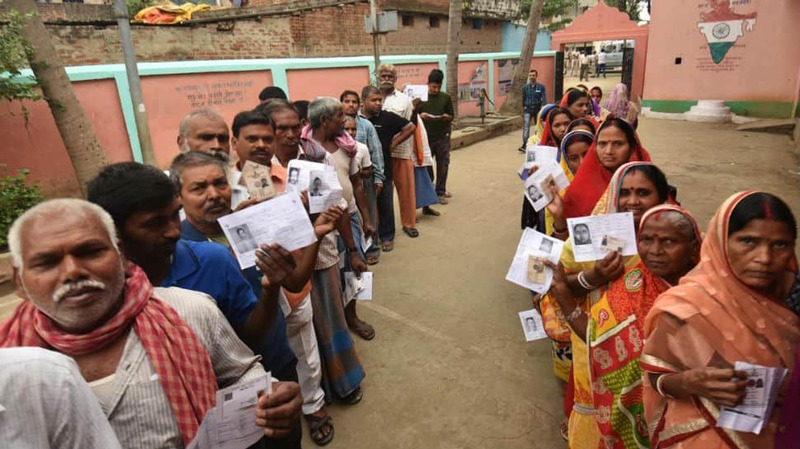 "We would like to thank millions of voters who came to vote despite difficulties, especially differently-abled and senior citizens," Deputy Election Commissioner Umesh Sinha. Election Commission declares first phase of voting in Lok Sabha election 2019 a success. EC says voting was largely peaceful, barring a few incidents of violence. EC also adds that 428 VVPAT machines were changed today. Telangana sees voter turnout of 60.57 per cent till 5PM. Voting in the first phase concludes for all except those currently in queues. Protecting the country, one vote at a time! Bihar: 49.5 per cent voting recorded in Aurangabad, 48.6 per cent in Gaya, 49 per cent in Nawada and 54 per cent in Jamui. Gautam Buddh Nagar, UP (breakdown): 50.43 per cent in Noida, 57.33 per cent in Dadri, 66.09 per cent in Jewar and 57.95 per cent in Janpad. 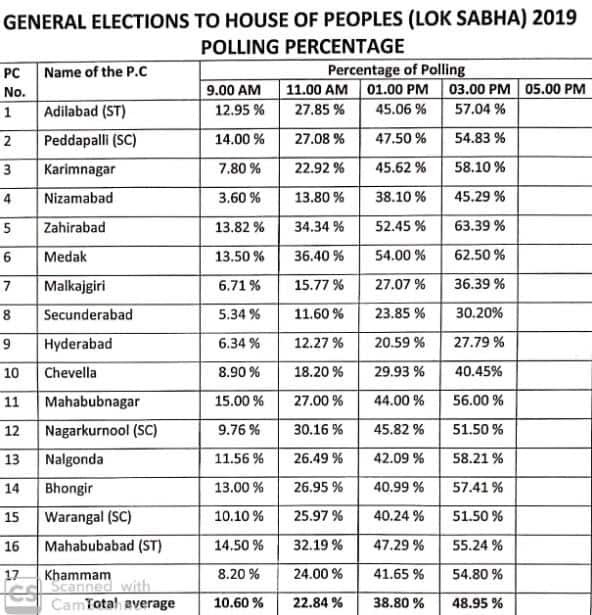 UP overall: Saharanpur - 63.67 per cent, Kairana, 60 per cent, Muzaffarnagar - 60.80 per cent, Bijnor - 60.60 per cent, Meerut - 59.40 per cent, Bagpat - 60.40 per cent, Ghaziabad - 55.20 per cent and Gautam Buddh Nagar - 58 per cent. 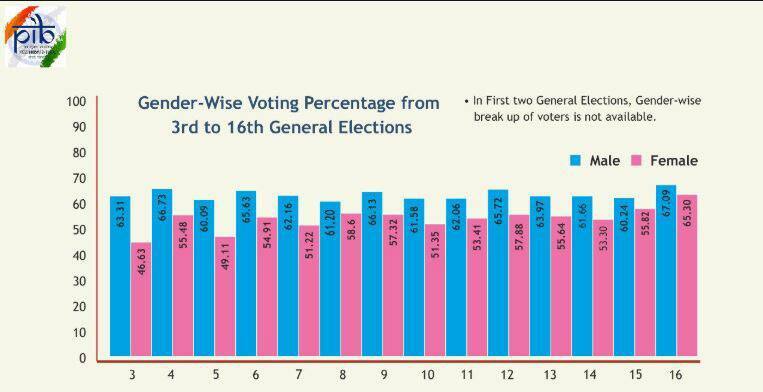 Gender no bar when it comes to voting! The Enclave Settlement with Bangladesh had added 9,776 'new Indians' to West Bengal's voter list. Voter turnout till 3 PM in Andhra Pradesh was 55 per cent, in Arunachal Pradesh was 50.87 per cent and in Sikkim was 55 per cent. 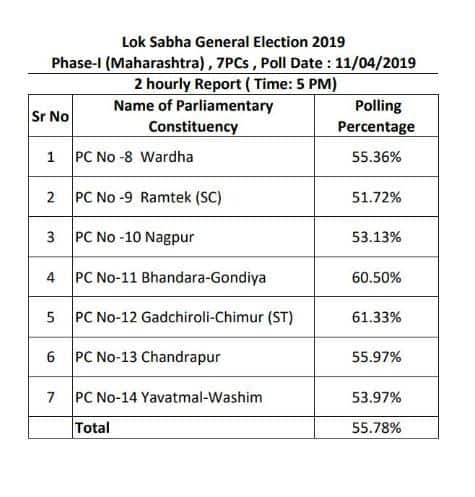 Voter turnout in Maharashtra till 3PM today is 46.13 per cent. In Jammu and Kashmir, it is 46.17 per cent. Prime Minister Narendra Modi slams Congress for indulging in corruption, says a new scam 'Tughlaq Road Chunav Ghotala' by it has come to the fore. Bihar: 38.50 per cent voting recorded in Aurangabad, 44 per cent in Gaya, 43 per cent in Nawada and 41.34 per cent in Jamui, till 3 PM. Voter turnout till 3PM in Uttar Pradesh is 50.86 per cent. 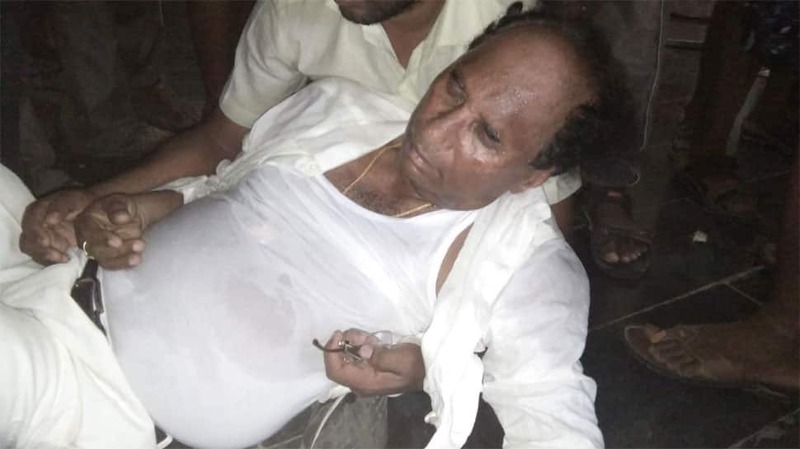 TDP leader Kodela Siva Prasada Rao attacked at a polling booth in Sattenapalli. Former cricketer and Telangana Pradesh Congress Committee (TPCC) working president, Mohammad Azharuddin, cast his vote at polling booth number 71. Security personnel fired shots in air after some ppl tried to cast vote without voter ID at a polling station in Shamli. District Magistrate says,“BSF personnel, fired in air for security reasons after some ppl without voter ID tried to cast vote. Voting has resumed now." Andra Pradesh: TDP worker S Bhaskar Reddy has died in poll clashes in Tadipatri town of Anantapur on Thursday during the first phase of Lok Sabha Election 2019. The party alleged that YSR Congress Party workers are behind the incident. Bihar: 34.60% voting recorded in Aurangabad, 33% in Gaya, 37% in Nawada and 29% in Jamui, till 1 pm. TDP candidate Kodela Sivaprasad Rao who was injured in AP's Guntur district. States with a maximum number of women candidates elected in 2014; Uttar Pradesh tops the list with 13 followed by West Bengal with 12. BR Tiwari, Additional Chief Election Officer on reports of Namo food packets being distributed in Noida: "We came to know about this from media reports. There is a very old shop, more than 10-year-old, which has this brand name. It has been highlighted in a different manner in media." "The right to vote is a precious gift that we’ve received from our freedom fighters & martyrs. The only way to express our sincere gratitude towards their sacrifices is to exercise that right," tweeted Rajya Sabha MP Subhash Chandra. The right to vote is a precious gift that we’ve received from our freedom fighters & martyrs. The only way to express our sincere gratitude towards their sacrifices is to exercise that right. AP Chief Minister and TDP supremo Chandrababu Naidu alleged that party leader Siddha Bhaskar Reddy was "murdered" after YSR Congress leaders' attacked him in Tadipatri, Ananthapur district. In a party release, Naidu further alleged that YSR Congress leaders also attacked "TDP Candidate and Assembly Speaker Shri Kodela Sivaprasad in Guntur's Sattenapalli", "Independent candidate in Nellore's Sarvaepalli", and TDP leaders in Guntur's Narasaraopet constituency and Ananthapur's Raptadu constituency. Clashes broke out between YSR Congress Party and TDP workers in Puthalapattu Constituency in Bandarlapalli, Andhra Pradesh. Police resorted to lathi-charge. Responding to Omar Abdullah's allegations, Poonch (J&K) District Election Officer said, "There was an issue with Congress button in Shahpur, our staff replaced the machine. At another polling station BJP button wasn't working, we changed that also." Top stars from the Telugu film industry including renowned actors Allu Arjun, Chiranjeevi, Ram Charan Tej, Nandamuri Taraka Rama Rao Jr also known as Junior NTR and SS Rajamouli came out and cast their vote in the ongoing Lok Sabha elections. Allu Arjun arrived at the BSNL office, Jubilee Hills, Hyderabad to cast his vote. The actor also urged his fans to exercise their franchise by sharing a post on his Instagram account. Today is that 1 day which will decide how the next 1825 days should be. Pls cast your vote. Sumitra Rai, 107, the oldest voter of Sikkim casts her vote Kamrang Secondary School polling station at Poklok Kamrang, South Sikkim. Maharashtra: IED blast by Naxals near a polling booth in Etapalli in Gadchiroli district. No injuries have been reported. 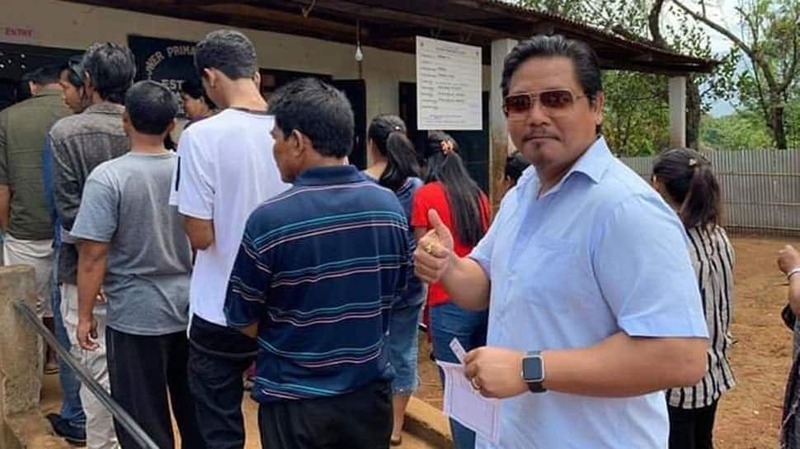 National People's Party chief and Meghalaya CM Conrad Sangma cast his vote in Meghalaya on Thursday. Sikkim: Nearly 15 per cent votes were cast in the first three hours of polling in Sikkim on Thursday in simultaneous elections for a new 32-member state Legislative Assembly and to pick its only Lok Sabha member. "Around 15 per cent polling has been reported overall," sources in the state Chief Electoral Officer`s office said. 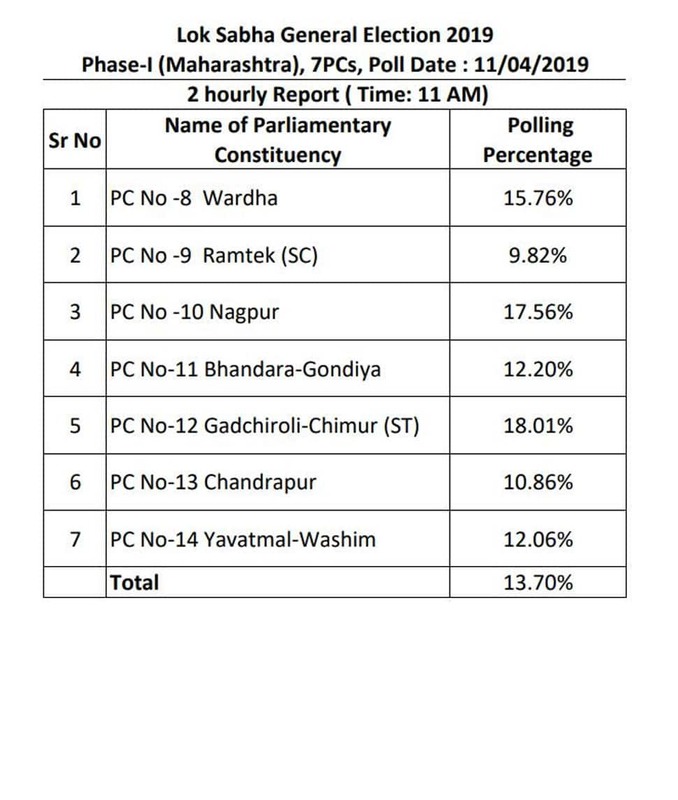 Voting began at 7 a.m. and will end at 5 p.m. A total of 423,325 voters are eligible to exercise their franchise in 567 polling stations to choose their representatives from among 150 candidates for the state Assembly and 11 for the lone Lok Sabha seat. DNA: Should Sadhvi Pragya contest election or not ?